Earth day is an annual event held on April 22 that is celebrated worldwide to promote environmental protection. Here at Aveda, we are constantly finding innovative ways to make an impact in environmental responsibility. Each year we designate the entire month of April to be Earth Month. 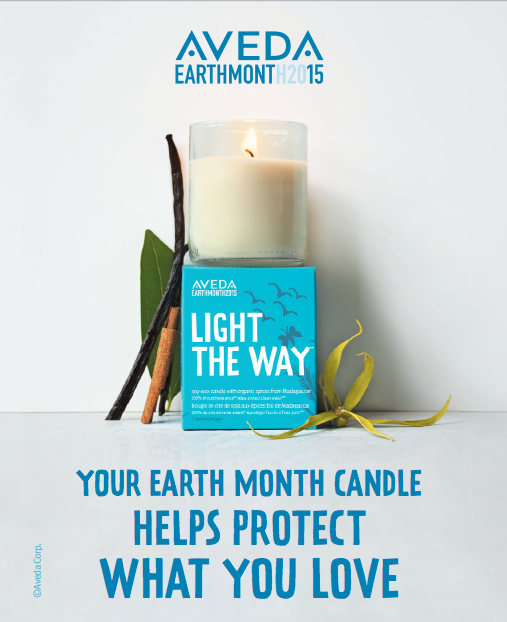 During these 30 days, 100% of the purchase price of our limited edition Earth Month Light the Way Candles is donated to Global Greengrants Fund, a non-profit organization that gives people, foundations and responsible businesses the opportunity to help solve pressing environmental problems. Since 2006, $9 million has been raised through sales of the Light the Way Candles. The concept of these candles is to provide clean water for those living without. For the price of one candle ($12), you are providing one years’ worth of clean drinking water for someone living in Manakara, Madagascar. The images found on the candle carton were created by local children living in that region who will feel the positive impact of this years project. The candle is made from 100% naturally derived soy and plant waxes and incorporates organic vanilla, cinnamon and ylang yland from Madagascar. As the candle burns, the combination of sweet and spicy provides a captivating aroma that you can enjoy while knowing you helped provide water for those in need.